Ticks Can’t Jump or Fly! They also don’t drop down from trees. However, they can attach themselves to our dogs (and to us as well!) and they do feed on blood, swelling up in the process, all of which is pretty gross and just a bit creepy. 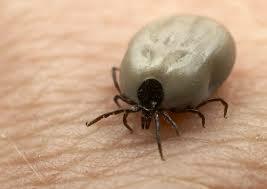 But taking a few precautions and dealing with any ticks that do show up will keep them under control. Although ticks would be happy with feline blood, they don’t often have much success as the cat’s grooming usually takes care of them. 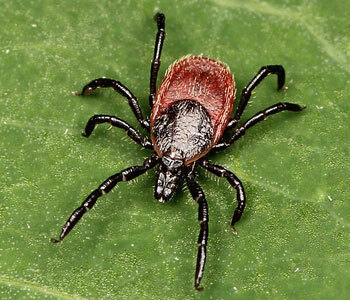 The main species of tick in our area is the Western black-legged tick, and it is mainly active in January-February, and again from May through July. They hang around on low level vegetation in warm grassy or brushy areas but don’t do well in wooded areas with lots of bigger trees. The ticks will crawl out to the ends of the branches or grasses with some of their eight legs hanging on and others waving in the air waiting to grab on to a warm-blooded creature that brushes against them. They are usually found on the head or front of a dog, but they can be anywhere. Once in place, they bite surprisingly securely into the skin, adding a biological “glue” to help hold them in place, and start drawing up blood, becoming gray and about the size of a pea over the next 48 hours or so. 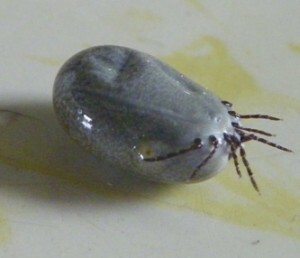 Ticks use the blood protein for egg development. After filling up, the tick will drop off, which is the time they may leave some bacteria behind. Note that ticks don’t actually burrow under the skin. The chances of you or your dog contracting a tick borne bacterial disease are very small, but it’s worth having some knowledge of both Lyme Disease and Anaplasma. Both conditions produce similar symptoms: lethargy, lameness, stiffness, loss of appetite, fever, enlarged lymph nodes. Both conditions can be serious but do respond well to antibiotics. Early detection and diagnosis is a must, so be aware. If you find a tick on your pet, don’t use poorly advised and generally ineffective folk remedies like gasoline or lit matches. Ticks are most safely and effectively removed by a slow and gentle pull without twisting, using tweezers or specialized tick removers. This will normally remove the tick with the mouth parts attached. Examine the tick to ensure you got it all and inspect the site on your dog for pieces left behind. The wound should then be treated with an antiseptic. It’s a good idea to keep the tick in a sealed container in the fridge or freezer for a while in case your dog develops any problems. Most often, the site heals quickly. Take your dog to the beach, an open field, or the forest during tick season. Avoid brushy areas such as power lines or south facing slopes. Check your dog over frequently and groom regularly. Promptly and completely remove any tick you find. Pay attention to the skin where a tick was removed and be aware of and vigilant about your dog’s general health. Do all this, and while ticks will always be gross and unwanted, chances are they won’t cause any significant problems.